Currently living outside Estacada, Oregon, Deirdre and Derek's studio is set on a beautiful 20 acre property with flowing meadows, and bordering protected forest. They have had the opportunity to share their love of clay - setting up home and studio throughout the U.S. - in Florida, Virginia, Missouri, New Mexico, Nebraska - and overseas in Japan. With each move came new experiences adding to their craft. Deirdre works mainly on the wheel producing functional ware for house and garden. Her creations often become whimsical with faces emerging from mugs, bakers and garden accents. There is always humor to be found. We just have to look. Derek creates fountains with a hand-building technique. The measure of success comes from the sound of the water. Derek is also the glaze master, finding and creating colors that enhance the clay. There is an endless well of information out there and an endless desire to find its treasures. The pots are all high-fired stoneware. 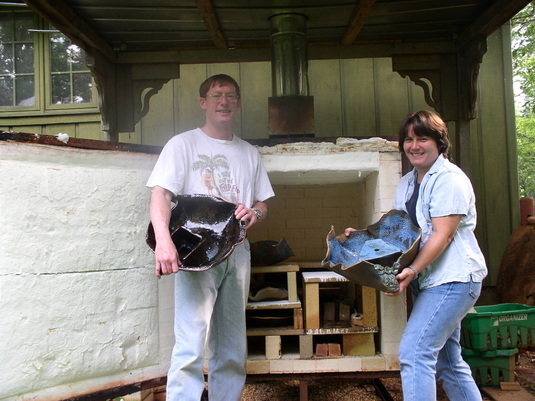 An electric kiln is used to bisque fire the pieces, and a Bailey down-draft gas kiln (or an electric kiln) is used to glaze to cone 10, heating to 2345F or 1285C. The glazes used are all food safe. No lead or toxic materials are used. ALL POTS ARE MICROWAVE, OVEN, DISHWASHER AND FREEZER SAFE. The garden pots can be left out year-round. In addition to participating in art/craft shows to show/sell our wares, we are displaying our work at the Spiral Gallery in Estacada, OR. Although D2 Pottery is currently a part-time business, both De and Derek are in the process of turning it into a retirement business.